The setting was intimate. 25 chairs line 3 rows as Harrison sat at the very front table. Surrounded by few nostalgic toys and a slew of recorders, Harrison gracefully eased himself into the chair….with a smile, I may add. Le sigh. How did it feel to return to the role of Han Solo after 30+ years? Well, he didn’t run for the hair dye. What was it like to come back to the legacy 30 years later? It was familiar. Same thing, only different. I was there in service of a script that I thought was very good. A sort of road map for the character that I thought was worth coming back to with a director whose work I admired and who I knew from a previous film [referring to when J.J. Abrams wrote Regarding Henry] twenty five years ago. It was an all together attractive prospect. You know, if we were trying to do exactly the same thing, if we were trying to pretend, if I died my hair and pretended that 30 years had not gone by, I would be much less comfortable. But this acknowledges the reality of the passage of time. It deals with the question of what happened while I was off stage for 30 years. And it deals with it in a really smart way. If it were not for the fact that these films have been passed on by parents to their children at an appropriate juncture in their lives and that generations have thus been introduced to me, I probably would have a much different career. Was it hard to get back into the mindset after so many years or was it second nature? No, you put on those clothes. You know, you turn around and see that guy in the Chewbacca suit. You know what the drill is. I have walked more than a mile in those shoes and it was a familiar path. I was happy to be back. Every word was written in stone. [yes, that was sarcasm.] Look it was a collaborative process and collaboration is not one person’s unilateral decision. It’s a matter of agreement. If it’s in the movie, J.J. agreed with it when we shot it. A lot of the process of film making is problem solving, is saying this is not working, is it? How can we fix this? And I love that part about it. There’s a kind of urgency and to try to keep the ball rolling, doing the right thing, because time is limited that there are a lot of people standing around waiting for you to get it right. All of those things, that’s a compelling atmosphere in which to work. I love that. But I don’t feel a sense of ownership or pride about these things. So I can’t remember what’s mine or what good idea came from the grip (from the set)? You knew that Harrison Ford was not going to get away from questions regarding his past. We held his hand (well, not literally…but I would have totally volunteered! ), and took a walk down memory lane. Do you have a favorite Star Wars moment from then? No. I don’t have an anecdotal memory either. I don’t have much of a memory at all. I could make something up but I’m not generally disposed to do that. I don’t come away from camp saying “we all had a great time” and “we love each other” and “it’s great”, although I could. I mean, it’s great to be back with Mark and Carrie. I spent a little time with them and a lot of the crew. Some of the older members of the crew have worked on the earlier films. But more often, there were sons and daughters of the people who worked on the original film now are still in the same craft business and were back to work with us. And I was back in England. I haven’t made a film in England since the last Indiana Jones movie which we tended to do there as well. And it was fun to be back in England. The food has gotten a lot better. When you read the first Star Wars script, did you have any concept of the legacy that it would become? No, No. You’d be locked up if you came to that conclusion. But in the context of making that first film, I did recognize both the utility of my character to the telling of the story and there might be, you know, somewhere in this, in this meshugas, there might be some really strong elements that people would relate to. I really, what I recognized was that I didn’t know much about science fiction, I didn’t care much about science fiction at that time and probably still don’t although I find it very interesting. It gives us the chance to explore places and things that we haven’t seen before and that’s cool. But what I recognized was that there is a kind of fairy tale structure in the characters and in the story. And I’d seen Grimm Fairy Tales that have lasted for the last 400 years, so that was a strength that I recognized and when you have a beautiful princess and a callow youth and a wise old warrior and then me, it was easy to figure out my place in that structure. I wasn’t expecting Harrison Ford to compare himself to a waiter. But check out this analogy. Out of all of the toys that have been made in the last four decades, is there anything that you particularly like or do you collect any of them for yourself? Well I mean, I just don’t get caught up in the toys. I really don’t care personally. [as he tucked the Han Solo toy on the table into his inner coat pocket…cue laughter] I mean, that’s great and that’s for other people. This is service occupation. Story telling is a service occupation much like being a waiter. You deliver the food. You don’t bang it on the table in front of them. You wait til the right moment, you set it down. You keep your eyes scanning the crowd, the diners. And you are there, when you see them beginning to look for you. It’s the same. It’s a public service job, you know. And the toys are for them, they’re not for me. First of all, I wouldn’t get them for free if I wanted them. (Laughing again) So it’s not about, you know, it’s not about me. I’m not the customer exactly but I love working here. 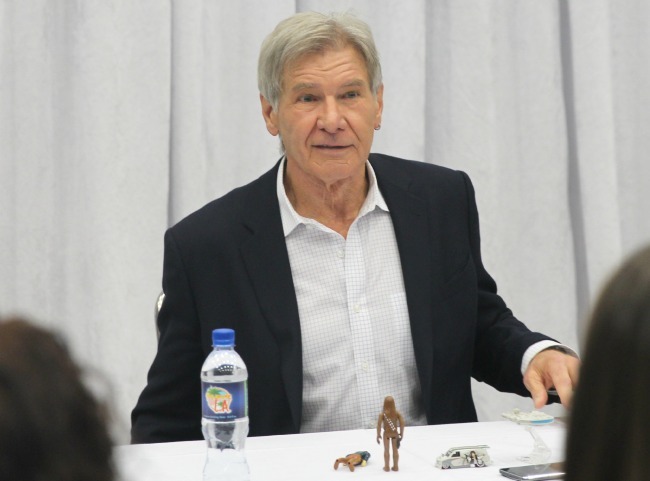 I felt a little pang of nostalgia and a tear in the eye as Harrison Ford reflected on what Star Wars has done for fans…perhaps including himself. In your opinion, what is the most appealing to Star Wars fans? You know, the breadth of the imagination that’s involved in these films, the strength, and worthiness of the mythology that underpins them, the questions that it generates in our minds about our own responsibilities, our own behaviors, all of that plus, whiz and bang and flash and music and good stuff. Then time was up. Could 20 minutes have passed so quickly? We were all waiting for Harrison Ford to rise when we saw the look of surprise on his face too. Really? I just think there’s a lot of people here and…go ahead, I’ll make much shorter answers. Yes and no from now on. Insert imaginary fist pump, here! 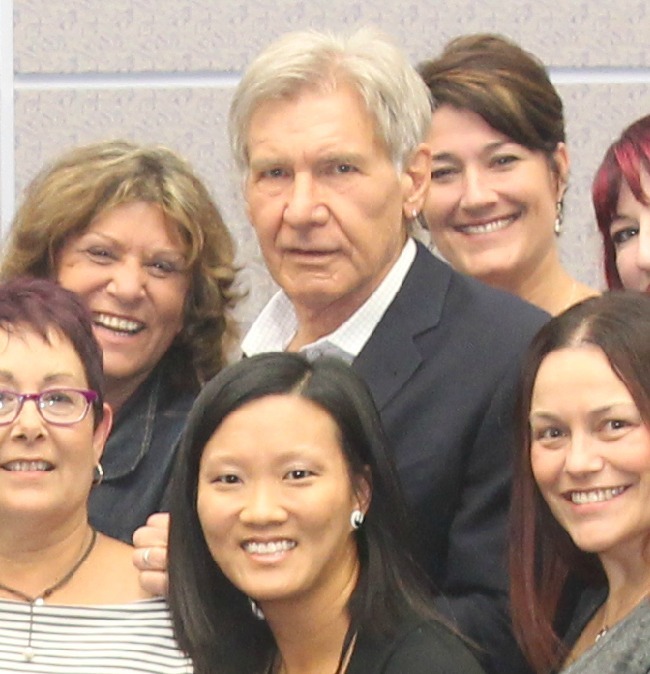 Harrison Ford wanted to stay (or my amazing Jedi mind tricks worked)! So we hurried into the rapid fire question session where I was able to sneak in a quickie. Was your interest of flying inspired by Millennium Falcon? What take away do you have or what do you want the new generation to take away from Star Wars? There wasn’t any. I’ve been doing this for a long time and I love doing it. I had a wonderful director. The hardest process is when you and the people you’re working with don’t see eye to eye. We see eye to eye. It was a luxury. You mentioned you don’t collect the toys, but do you have any props that you’ve kept over the years for yourself? I bought my horse and Daniel Craig’s horse from “Cowboys and Aliens.” I still have mine. And then we took the group picture. 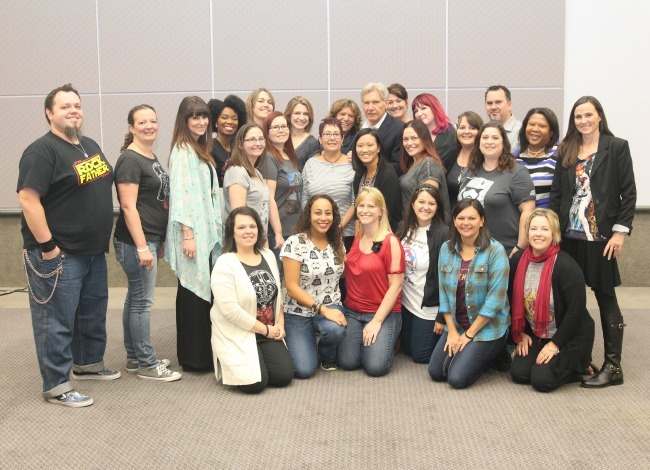 Do you see where I am for this #StarWarsEvent group shot? SWOON!! And just like that, the interview was over. Chock full of amazing insider info and cool fan-girl moments, this definitely tops the list of incredible moments as a blogger. However as I reflected on this interview as a family blogger and the significance this movie is going to have on a lot of families around the world, I leave you with this quote. I’m very grateful that these are family films…passed on as though there were some nugget of useful information or at least entertainment in them. Recognizing their value to the audience gives significance to me. 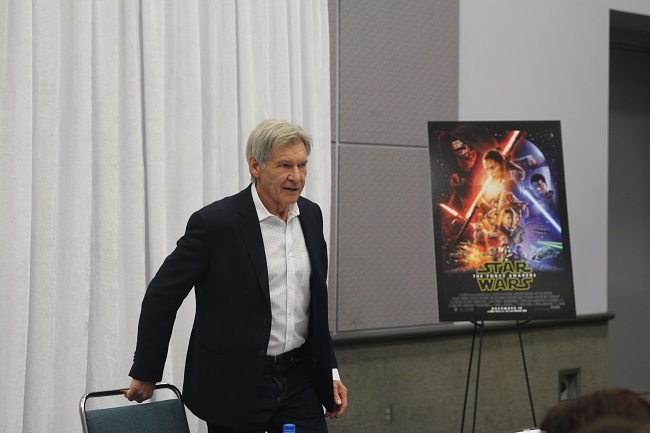 Hope you’re following along our #StarWarsEvent journey! Stay tuned for more amazing interviews next week, with J.J. Abrams, Daisy Ridley, John Boyega and more! Have you missed the fun so far? 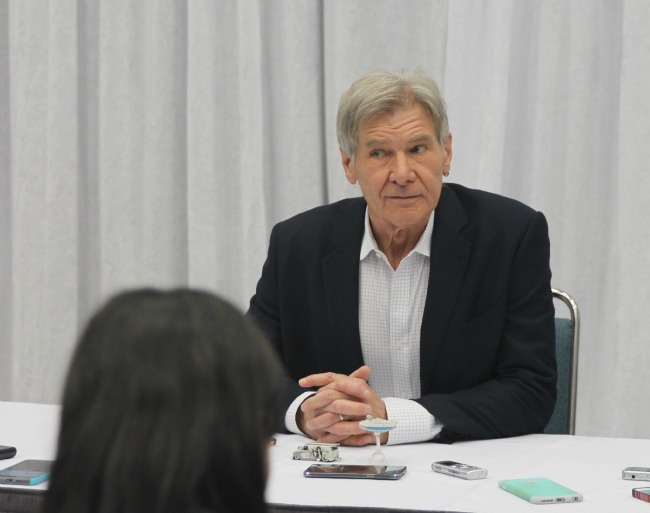 Check out my photo tour of the Star Wars: The Force Awakens Global Press Event! Are you ready for the most epic movie of the year? 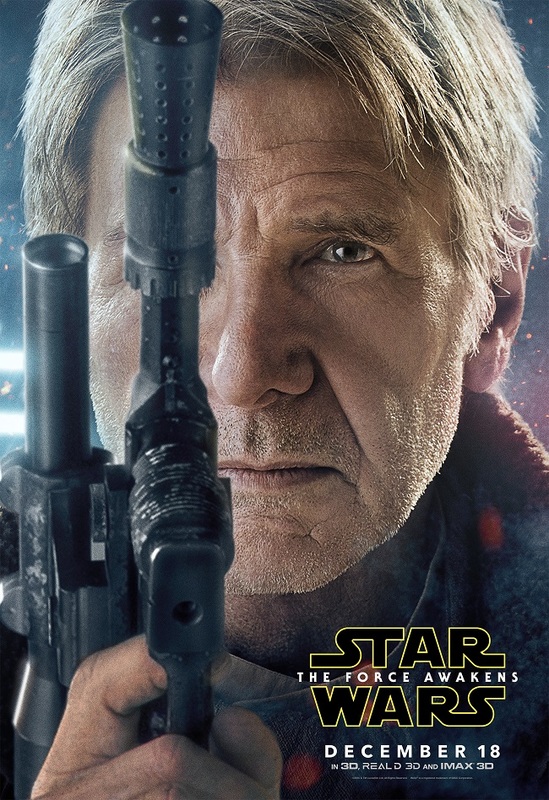 See Harrison Ford as THE Han Solo in Star Wars: The Force Awakens in theaters on December 18, 2015! 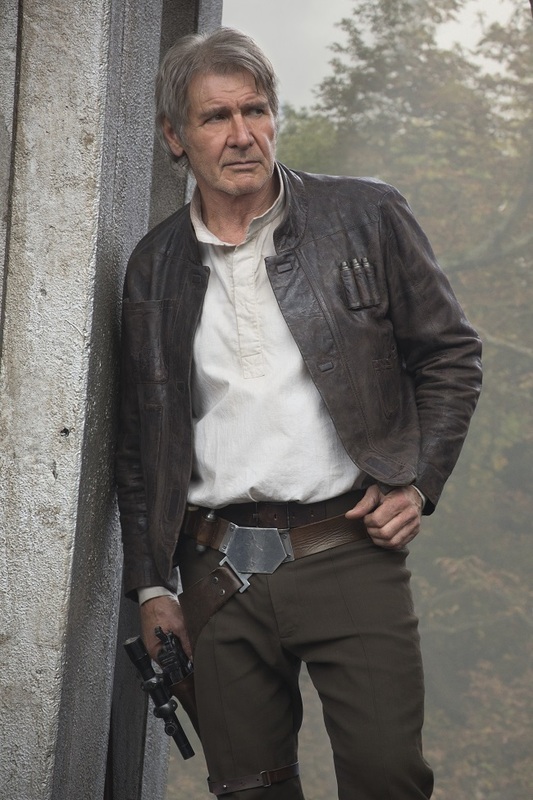 Are you excited to see Han Solo return in Star Wars: The Force Awakens? This post is sponsored by Disney. I received an all-inclusive press trip in exchange for this posting. All Star Wars loving opinions are my own. Be sure to follow Raising Whasians via Facebook, Twitter, Google, Instagram, Pinterest and YouTube for more Disney movie updates! How exciting. He is still so handsome after all these years. Actually he looks better than ever. I have been a huge fan of Harrison Ford and have seen most of his movies. Yes, I admit I had a big crush on him (still do!). He is wonderful as Hans Solo!!!! Can’t wait for movie. What a cool experience. He seems like such a nice guy. Fun event! I loved following along on social. I really like Harrison Ford. So cool that he is still acting and is coming back to Star Wars. It sounds like he really believes in the new script and the direction his character is heading in. I can’t wait to see this movie! What a cool guy! How cool that you were able to meet and interview him?! What an honor that must have been! 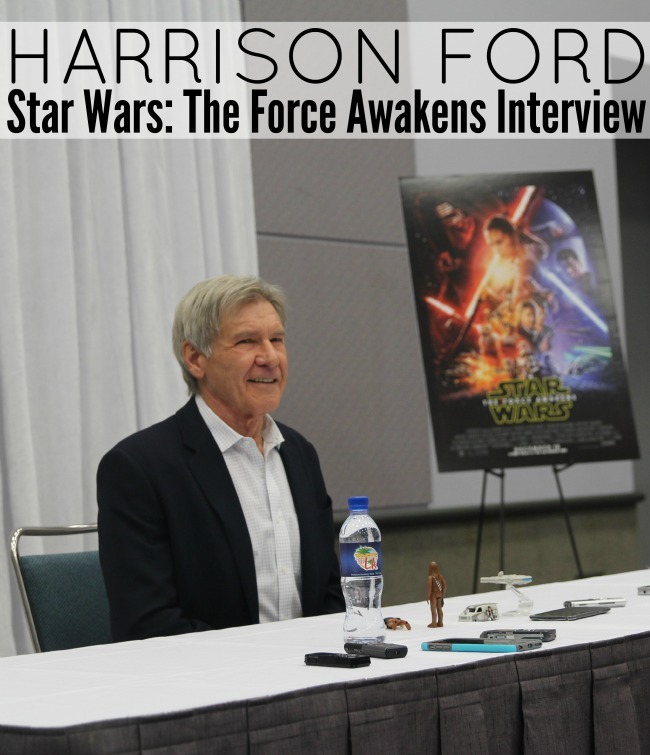 I can’t imagine sitting in the same room with Harrison Ford and in such an intimate setting! It must have been a thrilling time for sure. 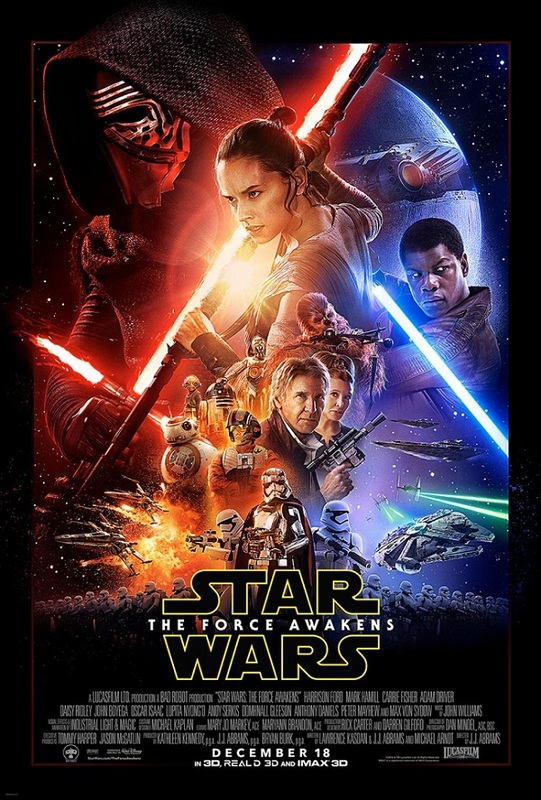 I am so excited to go see the new Star Wars movie. This is a fantastic interview. 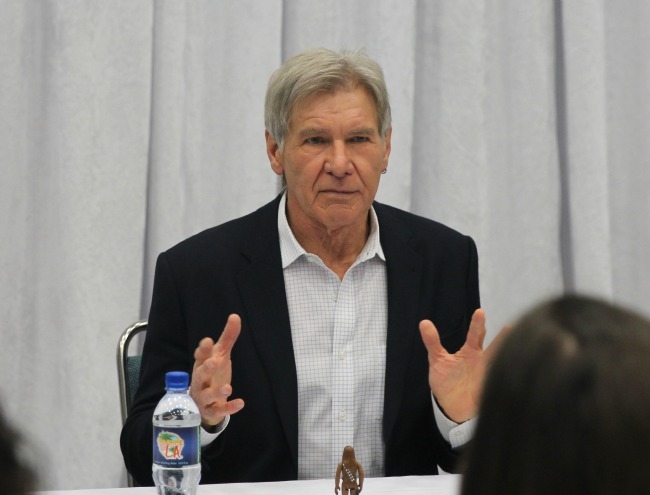 I would love to meet Harrison Ford. Great to hear he loves humor. He knows how to deliver a line, and he is good at it. Love seeing him. I am such a huge fan of Harrison Ford. So, I’m a wee bit jealous here. How awesome. This must have been amazing. What a fun and exciting opportunity! Harrison Ford is one of my favorite actors! I totally would have swooned if I was standing where you were in that picture too! 🙂 And I’m soooo looking forward to the new movie! I;ve been seeing this all over Facebook, including you!! First congrats for getting chosen for this. I understand there were only 25 bloggers who got to go. Second, I know you had a great time…picture do tell a story!! Great article on the movie. AHhhhh!! Harrison Ford is my favorite, he’s so handsome and such a great actor! So amazing you got that opportunity!! Can’t wait to see the movie! I can’t imagine this interview. It would be a pretty amazing experience. I know we’re all looking forward to seeing the movie as soon as we can! Harrison Ford is one of my favorite actors. He is also so handsome! I love that he extended the time on your Q&A. 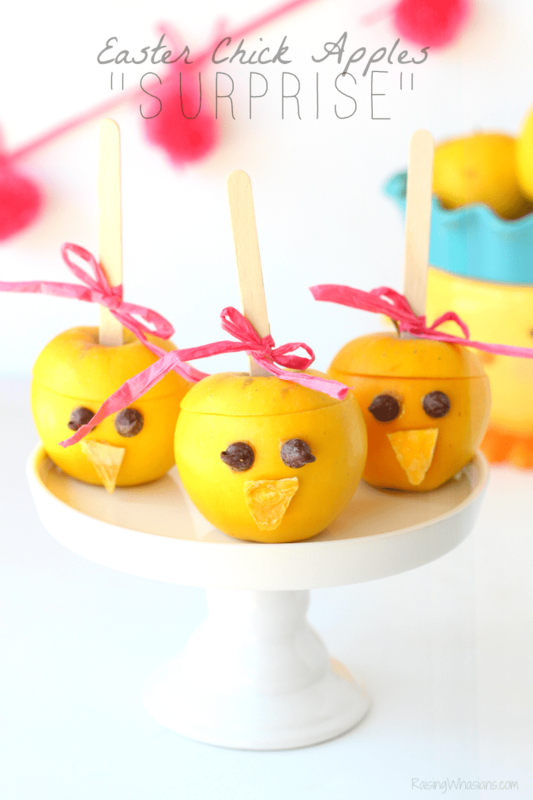 Such a sweet thing to do. So awesome! I love Harrison Ford! He is one of my favorite actors! This is so exciting! I can not wait for the new Star Wars movie! Great interview. I think it’s awesome that some of the crew are children of some of the crew that worked on the original trilogy. I agree that these films truly are a legacy, meant to be passed down from generation to generation. Wow! What a cool experience! And you basically could do some cropping and have a pic of you and Harrison Ford! Crazy! I love that he was funny and sweet. I’ve heard interviews where he wasn’t so open. Very, very cool! I have got to say that I am so happy that you got to meet him & take a pic with him, but I can feel a little envy!! Harrison Ford is a genuine true actor!! I love his movies – he is quite a charming man!! He sounded really down-to-earth in the interview. I love that his hair is natural. His hair didn’t come out of a box & neither did he!! I cannot wait to see this movie!! Thank you for sharing an interview of a lifetime!! What a fantastic interview. I would have swooned myself since I’ve been in love with him for a long, long time. What a neat experience! I enjoyed reading the interview and agree with other commenters: He is still so handsome after all these years! Hehas alwaays come across as personable and not so full of himself that he would be fun person to meet even if you had no cllue who he was. The first clue was when he said ‘cool’ to Mommy bloggers! He is still a haandsome fellaa, I saw him way back when and still love his acting.